A cupcake bouquet is a fun way to give a gift of cupcakes. You can easily change the looks of your bouquet by how you arrange the cupcakes, decorate your cupcakes or by using a planter pot or a vase. They turn out beautifully and are a lot of fun to put together. A vase or clean planter pot. If you are using a glass vase fill the bottom of the vase with something pretty or fun like, colored pebbles, confetti, etc. Styrofoam ball wrapped in tissue paper or cellophane. Cupcakes baked and cooled. Use a cake recipe that is heavier like this pound cake recipe. Don't use a moist cake mix because it will easily fall off the skewers. Decorate cupcakes how you would like. The cupcakes in the pictures below were made with piping rosettes. The rosette design makes the cupcakes look like real flowers however you could decorate in other ways as well. A sunflower can be made by using a leaf tip with yellow frosting. Decorate all around the cupcake except in the middle to resemble yellow petals. In the middle use a chocolate frosting with a dot tip. Add dots in the middle. 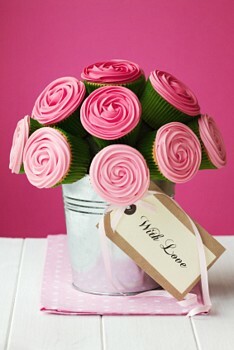 Once your cupcakes are frosted as you'd like put them to the side and prepare your vase or pot. Wrapping your styrofoam ball with tissue paper or cellophane will make a more decorative look. Place the ball inside your vase or pot. If needed cut the ball to fit. You'll want to arrange this ahead of time making sure it is just how you'd like it and fits snug. Place your skewers in various spots into your styrofoam ball. If needed short your skewers with scissors or press them farther in your styrofoam. Carefully press your decorated cupcakes in the tops of your skewers. Arrange and present as a gift or keep for yourself!